I’m not a big fan of mayonnaise. When I still lived in California I avoided mayo, mostly because of the fat content. If I really needed some for a specialty dish, I could run to the store and pick up some Veganaise–something I can’t do here in Guatemala. 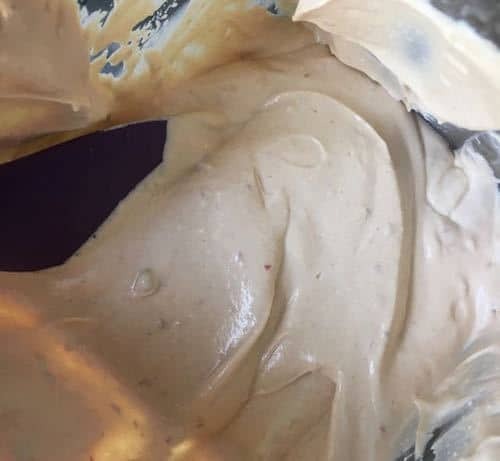 Since my dad’s favorite late night snack is peanut butter and mayonnaise sandwiches, I dusted off my tofu-based vegan mayo recipe, which I developed in 2012. I experimented with a lot of recipes, including some using the traditional method: slowly pouring oil into a running blender with lemon or vinegar to make an emulsion. None of them captured the essence of mayo the way this tofu-based version does. Not only is this version easier, it is far lower in fat than the oil-based recipes. This recipe does use one tablespoon of oil, which gives it a more authentic mayonnaise texture; feel free to omit it if you don’t want added oil. As a bonus, it’s easy to flavor this mayo in so many ways! The photo with this article shows the chipotle version, but I also make a curry version. Or, add some basil pesto to make a delicious mayo for sandwiches. This recipe calls for firm tofu because that’s what I have available. If you can get silken or soft tofu, adjust the amount of water. Place all ingredients except the spices in a blender, starting with 3 tablespoon of water. Blend until completely smooth and creamy, adding more water one tablespoon at a time until you get the consistency you want. Add optional spices at the end, blending again until smooth. Hi, I'm Traci. My passions are vegan cooking, music, and sharing the beauty of Lake Atitlan, Guatemala. Read more about me here. Get weekly blog summaries in your inbox!